Organized by the Istanbul Research Institute’s “Istanbul and Music Studies Program” (IMSP), the “Sounds of Istanbul” series of speeches is set to become a veritable ‘artists’ memoirs’ with panels that host master musicians as guests. The first event of the series, moderated by Cihat Aşkın, sees famed violin virtuoso Ayla Erduran reminiscence her career as well as the development of Classical Western music in Turkey since the 1950s and where it stands today. The discussion will be followed by a short recital from Ayla Erduran, Cihat Aşkın, and Eren Aydoğan. 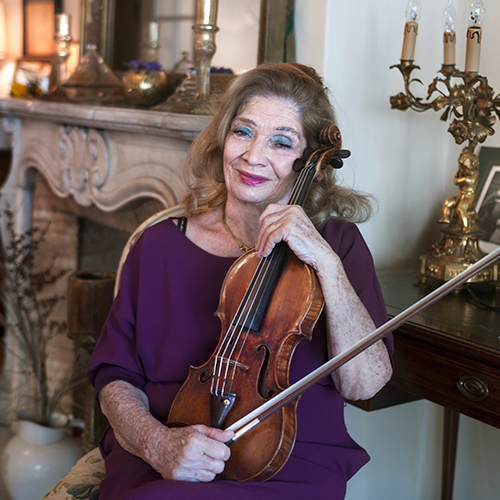 Introduced to violin by her mother, Ayla Erduran became a student of Karl Berger when she was only four years old and gave her first recital at the age of ten at the Saray Cinema, accompanied by Ferdi Ştatzer. In 1951, she completed her violin studies at Paris National Conservatory, where she was a pupil of Benedetti and Benvenuti. From 1951 to 1955, she worked exclusively with Ivan Galamian and Zino Francescatti in the US, and performed with an orchestra conducted by Thomas Schermann in Newark in her US debut. Her concert career in Europe began in Poland where she performed a violin concerto of Glazunov accompanied by Warsaw Philharmonic. Between 1957 and 1958, Erduran worked with David Oistrakh at the Moscow Conservatory, and in 1957, she was awarded in the International Henryk Wieniawski Violin Competition by placing sixth among 120 violinists. In 1958, she performed the Belgian premiere of Ulvi Cemal Erkin’s violin concerto under the conduction of the composer himself. In addition to her concerts and recitals in Europe and the US, she made her first major tours in Canada between 1961 and 1962, performing in 160 concerts in total. She went on a Middle East tour with the Presidential Symphony Orchestra in 1963, and in 1964, she won the Harriet Cohen-Olga Verney Award with her first recital in London with Mithat Fenmen. Her concert at the London Albert Hall in 1965 was broadcast live by BBC. The same year, she took to the stage in Geneva for a concert celebrating the centennial of the birth of Sibelius. In 1968, she began her Africa tour with Verda Erman, won the Beethoven Award in the Netherlands in 1970, and was granted the title of State Artist by the Republic of Turkey in 1971. From 1973 to the 1990s, she worked as an instructor in Switzerland while continuing her concert career. She played with a number of prominent orchestras including the London Symphony Orchestra, Suisse Romande, Berlin RIAS, and Czech Philharmonic among others. Her recordings have been aired on radio in Canada, Switzerland, the UK, Germany, Brazil, Bulgaria, Russia, Poland, Iraq, the Netherlands, and various states of the US. Her performance of Brahms’s Violin Concerto with the London Philharmonic Orchestra conducted by Carlos Paita was released in LP. Her Franck, Debussy and Grieg violin and piano sonatas with Ayşegül Sarıca were released in CD format under the UPR Classics label, and her Brahms and Bruch concertos with the Suisse Romande Orchestra conducted by Richard Beck and Armin Jordan were released under the Gallo label. A biographical novel on the life of Ayla Erduran by author Evil İlyasoğlu, titled Ayla'yı Dinler Misiniz? (“Do You Listen to Ayla?”), was published by Remzi Publishing House in 2002. In her performances recorded for the Archive Series, she used the “Nelson-ex, The Roderer" violin (1710) made by Antonio Stradivarius. The event will take place at the Pera Museum Auditorium. Free of admissions; drop in. The talk will be in Turkish.